I've worn the Result Performance R54 Tech 3 fleece during some cold, windy weather for low level walking in Cheshire and Shropshire during Autumn and early Winter. The material is a soft, relatively high density filament yarn with polyester lining and front panels. 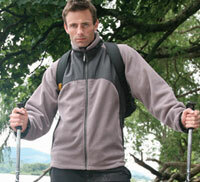 In use, I found it to be warm and really quite windproof with moderate breathability. I'm 5'10'' and of medium build. The overall length and sleeve length were both very good. The sleeves don't have a cuff adjustment but did have just enough 'stretchiness' to enable me to push my sleeves up to give a little more flexibility for temperature control. There's a waist -adjuster (which is good) but - rather unusually - this is accessed from inside the hand-warmer pockets. I found myself losing items out my pockets as I tried to adjust it and once it was adjusted, the pocket volume was reduced significantly. The collar zips right-up and can be adjusted to create a nice snug fit. Inside there's a handy mobile phone pocket plus a second bigger inside pocket - but sadly, neither are large enough to take an OS map. Also on the inside was another zip which appeared to give access to the entire space on the inside of the garment between the mesh lining and the outer layer. It obviously has another purpose - but could be annoying if you'd inadvertently put anything in there that you then needed again quickly (like an OS map!). On the outside there are 2 zipped hand-warmer pockets. These are positioned right where the hip belt of my back-pack went - which I found was a real nuisance. There's a good, robust zip with a big tag which makes it easy to use with gloved hands. It opens only from the top-down but does have a substantial storm flap so there's no heat loss here. The Result Performance R54 Tech 3 Fleece is a good value, warm fleece that is great for use around a camp-site or for walking to/from the pub in the evening or for low level walks with a lightweight day pack. However it's very bulky and relatively heavy so isn't great for backpacking or for walking with a backpack.